New York City's Rockefeller Center is famous for its holiday displays, but the plants and floral arrangements that wow visitors originate much closer to home. Bob Hoffbauer, one of Roehrs' owners, cares for the poinsettias. It's in the greenhouses of Julius Roehrs Co. Exotic Nurseries that the poinsettias, chrysanthemums and azaleas used to create seasonal or holiday displays at Rockefeller Center's gardens and the Easter lilies that adorn St. Patrick's Cathedral at Easter come into bloom. 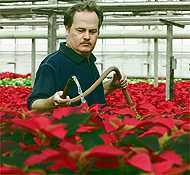 "We start the poinsettias as early as May," said Bob Hoffbauer, one of the Roehrs' owners, explaining that growing the 35,000 poinsettias the Howell nursery produces is a formidable challenge. The poinsettias are grown from cuttings and take careful nurturing to come into bloom at the right time for holiday display. "Poinsettias need 60 days of complete darkness to set a bract (a petal-like leaf)," explained Hoffbauer, a Colts Neck resident. "The temperature in the greenhouse must be kept in the low 60s and feeding is critical." "If you disturb that rhythm, they won't cooperate, so we absolutely never turn the light on at night," said Karen Hoffbauer. The Hoffbauers are a brother and sister team who together to run the 130-year-old nursery. Bob's purview is production and administration, while Karen oversees sales and marketing. Bob joined the company in 1975 after graduating from college. Karen left a career in marketing to help run the nursery. The two are related through marriage to the nursery's founder, Julius Roehrs, who immigrated to the United States in 1864 and became the gardener on a Jersey City estate. (Their father's uncle married Roehr's daughter). An accomplished horticulturist in his native Germany, Roehrs was just 20 years old when he became a gardener on the estate of a wealthy industrialist, eventually becoming chief orchid grower. In 1869, he left the estate to found his own nursery on 17 acres in East Rutherford, where he grew flowering plants for private customers and for the newly fashionable retail florist shops in New York. 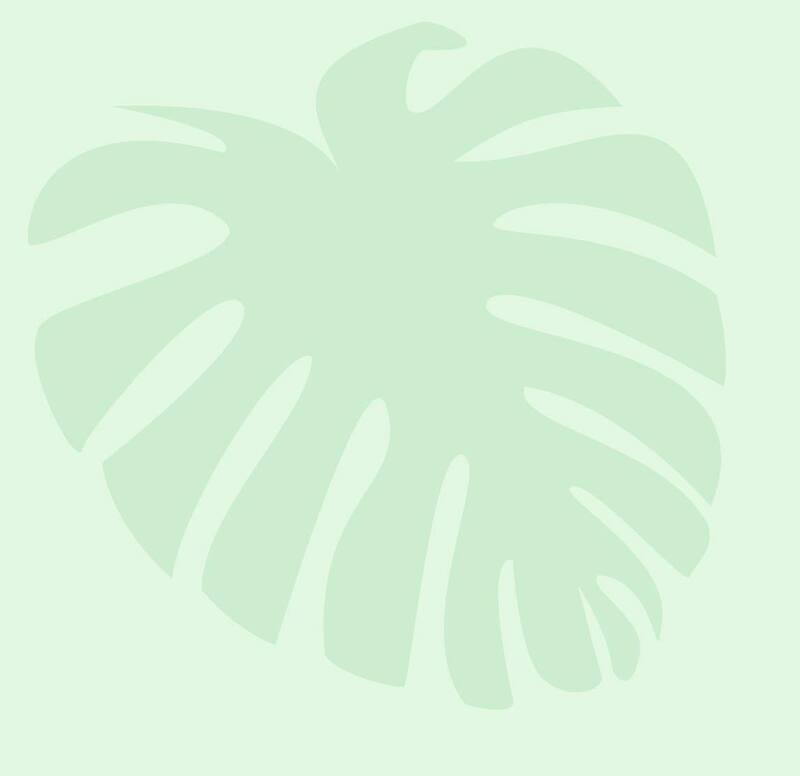 He is credited with helping to introduce tropical plants to the United States. Today, Julius Roehrs Co. Exotic Nurseries occupies an 86-acre tract that spans Farmingdale and Howell. According to Bob Hoffbauer, the nursery has 200,000 square feet of growing space under glass -- 6 acres -- where plants from diminutive annuals to the 25-foot ficus trees that grace the 15 buildings and summer garden at Rockefeller Center are grown. The nursery's 12 greenhouses represent one of the largest collections of ornamental flora ready for use in the United States. One of the largest tropical nurseries in the metropolitan area, Roehrs has an entire greenhouse devoted just to foliage plants. The major focus of the firm's business is "greening" corporate offices and shopping malls. The nursery is one of the largest commercial interior landscape design and maintenance firms in the metropolitan area, Karen pointed out. In addition, Roehrs participates in several major flower shows annually, including Macy's annual flower show, and supplies many exhibitors at flower shows. Located on Route 33, the nursery is open to the public from 9 a.m. to 3 p.m. Wednesday through Saturday. Bob Hoffbauer pointed out that while poinsettias are the nursery's major focus at this time of year, they actually grow more chrysanthemums than anything else. "We grow mums 46 weeks of the year," he said, estimating that the nursery produces 50,000 mums for fall displays. An entire greenhouse is dedicated to growing mums. "We brought one 600-foot greenhouse when we moved the company from East Rutherford to Howell, he explained. We re-erected it, built side houses and added over the years. Our mum house is fully automated. Computers control the temperature, lighting, shading and feeding." "No matter how many we have (mums), we never have enough," added Karen Hoffbauer. "We grow them from cuttings and it's 12 weeks from cutting to bloom. We provide 2,000 per week for interior plantscaping." While some greenhouses are fully automated, there is still plenty of hands-on work to be done, both Hoffbauers acknowledged. "Absolutely. Potting, watering, pinching, debudding, making cuttings, rooting are still done by hand," Bob said. "Most things here are done the old-fashioned way," Karen said.